FREE $5 Plum District Code! 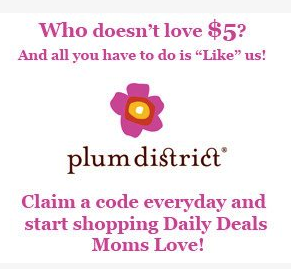 Like your local Plum District page on Facebook and you'll get a $5 code! The code will be good on any Plum Deal (no steals) and expries 12/11/11. If you already like your local page you can still get a $5 code. On the facebook page look at the left sidebar that says $5 Promo. You can get a new code everyday until 12/9/11!